Except for converting my MaxAir from gas to electric and back as the need rises, I haven't needed to get into mine either. Very interesting thread though. I look forward to each post. Tbone, you gotta know I can't do that. Its definitely good advice and I appreciate it, but one of the satisfactions I get out of this little RIX is knowing that I got it running at peak performance. When I am filling a tank and it feels warm from the fast fill... It makes me proud. Thanks TBone. You are making a lot of good sense. And, the bill for buying a new piston stings enough to temper my need for speed. In fact, your comment about more effective moisture traps correlates with what I've been seeing downstream from the Back Pressure Regulator (BPR). The faster I've got my RIX to fill, the less efficient my moisture separators have become, and the more moisture I have been draining from the bottom of the BPR. This last 2.875 cfm fill rate test dumped almost as much water out of the bottom of the BPR as what came out of the drains from the moisture separators. I've been picturing that the faster I pump, the more splashing rather than settling occurs in the separators. When I pulled the 3rd stage piston (after I ran this last test with it broken), it was pretty gummed up again. On the other hand, your comments about the RIX being designed for the Military ring true in how tough these little machines are. The 3rd stage cylinder has probably been running this piston broken for quite awhile and there isn't a single scratch or a gouge in the cylinder surface. I have a broken piston but all I have to do to fix it is spend the money to replace the piston. And the compressor will fill tanks as well or better than it always has. When I spoke with Art at RIX Tech Support, I asked him what may have caused the piston to break. He said (as you know) the floating piston gets at least one impact from the piston rod at start up as the incoming pressure forces it to ride the end of the piston rod. I was thinking that a combination of the gummed up 1st and 2nd stages not delivering sufficient pressure to maintain piston rod contact with the 3rd stage piston could mean extra impacts, hitting harder at peak RPMs, eventually breaking the end of the piston. RIX wants $768 for an assembled 3rd stage piston. For just a piston, its $333. I priced it out with all of the rings and it comes to $488 in un-assembled parts. So, that's what I'll order. 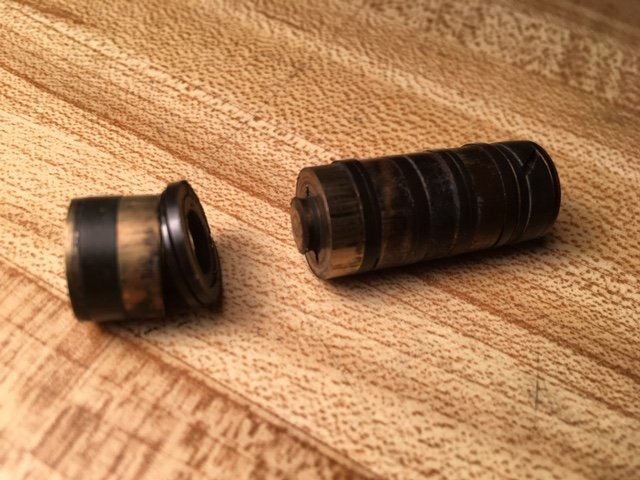 I could probably save some money with some do-it-myself repair or just make another one on the lathe but, by the time I figure in the time and effort, I wouldn't be saving all that much. This way, I get the part, install it, and I'm back up and running. - I worked on the compressor Saturday and got the new piston installed and everything back up and running smoothly... Perfectly, actually. I learned a lot on this most recent challenge of solving the slow fill rate. And, I've been meaning to write it all down so I don't forget. To start with, probably the most valuable lesson here is that RIX Compressors Are Different. Certainly they share aspects of Air Compression with other compressors. But the "Oil-Less" compression mechanism has some unique aspects that I don't think the instruction manual completely explains. - Teflon Rings: There's no crank case filled with oil. The compression rings on a RIX are made of a teflon material that's flat and coils like a typical piston ring. BUT, it has no spring characteristics to keep it pressing outward to create a seal. Instead, it has an O-ring underneath the compression ring that provides all of the outward flex to seal the gas between the piston and cylinder wall. - Teflon Rings Are Self Sacrificing: They provide their own dry lubricant as they wear against the cylinder walls. The good news here is that the rings are what wear out, not the cylinder walls nor the pistons. And the rings are easily replaceable. The bad news is that as they wear, they produce a teflon dust residue. And if there is any moisture in the incoming air, it mixes with the teflon dust and starts gumming up the ring movement. I made a BIG mistake when I replaced all the rings last year... I used some of that food grade silicon spray lube to make the new rings slide into the pistons easier. That's right, I introduced moisture where I should have kept it dry. Over the Summer of filling tanks, my rings got gummed up more and more until they stuck in an almost totally compressed condition. And that's what made my compressor pump so much slower. - Slow Pressure Can Break Things: The 3rd stage piston on my RIX is "floating". It doesn't connect to its piston rod. The proper function is for the compressor to build pressure rapidly, forcing the 3rd stage piston to stay in contact with its piston rod. If this pressure doesn't build rapidly, the piston just gets hammered over and over until the pressure finally comes up. I believe this is what broke my 3rd stage piston. Now that I have the compressor running properly, I can actually HEAR the 3rd stage piston hit the piston rod once or twice before they settle into constant contact and become quiet. As was stated elsewhere, the first priority of the Back Pressure Regulator (on the RIX) is to build pressure rapidly so as to reduce hammering of the 3rd stage piston. I will add that its important to close all your drain valves before starting to assist in rapid pressure build. - Keeping It Clean is Easy: Following the RIX tech's advice, I scrubbed the cylinders with Dawn detergent, hot water, and a green scotch brite pad with bottle brush back-ups. Rinsed with a fresh water squirt bottle and air blast several times. Then, I scrubbed the piston rings on the pistons with a nylon toothbrush and Dawn with hot water. Lots of black gunk came out. I scrubbed until the suds remained white. Then, rinsed with fresh water and air blast. I let everything dry fully before re-assembly. This cleaning process allows you to watch as the rings get freed from their gunk, they start to expand outward and you discover that they're still good rings... You don't need to replace them. And since the RIX has no crank case, popping the pistons out for an occasional ring cleaning is pretty easy. You wouldn't need to do this on a conventional oil-lubricated compressor. BUT a RIX is Different. the hammer of the 3rd stage can be minimized with slower soft starts. Can't really do it without a VFD, but it's something that I'm going to be programming into my SA6's VFD. Give 10-20 revolutions of the compressor at slow speed then start the ramp up. Definitely can't do it with gas motors, and I don't know enough about electrical "soft starters" to know if you can program the duration of the soft start. I think we talked about this earlier, but what I'll be doing is keeping the Rix as electric and when I need to boondock, use a generator. Bit more expensive, but at $300 ish for the VFD, and whatever the generator size I choose, it gives me flexibility to power whatever else I may need while I'm out there, but also tailor the compressors speeds to what I need at that time. Food for thoughts. - After getting everything put back together, cleaning up and putting the tools all away, I pumped a few partially full tanks and got everything in my tank collection pretty much topped off. And (of course) I got to wondering if my RIX compressor is maintaining its top performance. So, I emptied out my test tank and did the Fill Rate Challenge (again). I filled a steel 72 from 0-2200 psi in 22 minutes. That's 64 cf in 22 minutes... equals 2.9 cfm. The Laser RPM meter said 2255 rpm which is a hair slower than the 2300 rpm specified in the manual. - So the RIX SA3 pretty much lives up to it's name as a true 3 cfm compressor. 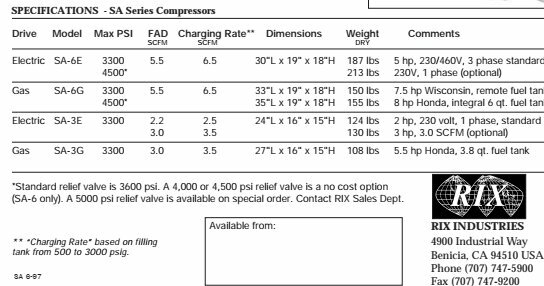 - I started this thread with a "Challenge" to see how many compressor owners have their compressors pumping at the true fill rate their machines are advertised to deliver. This revealed the concept of "SCFM" which is often referred to as the "Charging Rate" and uses the time it takes to fill a tank from 500 psi to full and crediting the full volume of the tank to that filling time. - The ACTUAL fill rate or FAD (Free Air Delivery) method counts the time it takes to fill a tank from 0 psi to full. The FAD is always lower than the SCFM but it is the true fill rate. But sometimes, SCFM is used in place of CFM (FAD)... Giving a false idea of the true cfm. - As you know from my most recent entries, my RIX SA3 is pumping at 2.9 cfm by the FAD method. Pretty close to full capacity.